Nusa Penida is an island southeast of Indonesia's island Bali. 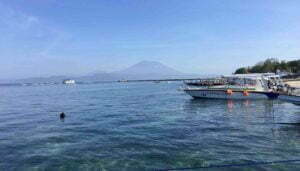 You can reach it in only 30 minutes by speedboat from Bali. The landscapes are beautiful, the diving spots are world class and the inhabitants are very welcoming. Yet, the island was still, until recently, practically virgin of tourists. Nusa Penida is an island of Bali province. It has a population of about 45,000 inhabitants and covers about 200 km2. In 2010, a 20,057-hectare area around Nusa Penida and the neighboring islands of Nusa Ceningan & Nusa Lembongan were declared a Protected Maritime Zone. The island was mostly known until recently for its diving spots. 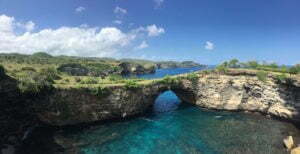 Nusa Penida enjoys about fifteen internationally renowned scuba diving sites. The seabed is home to 296 species of coral and 576 species of reef fish. But divers also come from all over the world to see the manta rays, present throughout the year, and the moon fish (Mola Mola) from July to October. 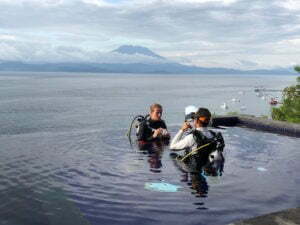 And some find out they love scuba diving after a discovery dive with Manta rays ! Warnakali dive center is a good option to discover scuba diving, to get some PADI certifications or simply to enjoy fun dives in safe conditions. 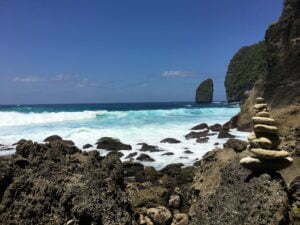 Nusa Penida island has remained wild and offers superb views. There is so much to see in Nusa Penida that you will have to make choices. The entire south coast features 150 m high cliffs that plunge into the sea. Promise for awesome photos at Broken Beach, Temeling or Guyangan for example. But also promise for thrilling moments for those who will have the courage to trail down to the beaches. The north coast of the island is mainly dedicated to seaweed cultivation. From there you will have a breathtaking view of Agung volcano. The center of the island is very hilly. You will even find there a place called Teletubbies in reference to the famous cartoon! There are also some very nice beaches on Nusa Penida island. Easily accessible like Crystal Bay or Atuh Beach. Or who deserve a bit more efforts like Kelingking Beach, Gamat Bay or Suwehan. Many spots on the west coast will offer amazing sunset experience. One of the best option to take a drink around a pool while enjoying the sunset is Amok sunset bar and restaurant. There are, as everywhere in Bali, many temples. And there are also very often ceremonies to which the inhabitants will invite you willingly. But the temple of Goa Giri Putri is a special place for all Hindus in Bali. They must come there at least once in their life. You enter through a narrow gut that will take you after a few meters in a huge cave. The complete course of purification involves a dozen stations in the cave and lasts about 2h30. But you will probably decide to go faster! The Ped Temple is even more important but it is not open to tourists. The history of Nusa Penida is quite fascinating. It mixes some facts and many legends. And the main Balinese religious events are also taking place on the island, in a more intimate setting. The Klungkung province decided in 2013 to launch a major development plan for the island (roads, electricity and water network in particular) to support the development of tourism. The island has also been designated as a strategic district at the national level (Kawasan Strategi Pariwisata Nasional, KSPN). Nusa Penida therefore benefits from this $ 20 billion program to support tourism development in Indonesia. Many investments have been made in terms of infrastructure. Water and electricity are available almost everywhere on the island. The road network is almost totally renewed. And marketing efforts have paid off. The first hotel with swimming pool, Namaste Bungalows, opened in 2013. But tourism has mainly started to develop in spring 2017. And since then the island is developing very fast. It is also very easy to get to Nusa Penida. There are nearly 40 speed boats that connect Bali and Nusa Penida every day in 30 minutes from Sanur and in 15 minutes from Kusamba. You can choose to arrive in Sampalan or in Toyapakeh. You want to visit Nusa Penida ? Do it before it is too late ! Because tourism is developing so fast, you may want to visit Nusa Penida now. While it remains wild and special. How many nights is it worth staying in Nusa Penida ? This is often the question I am asked. One night seems really the bare minimum. 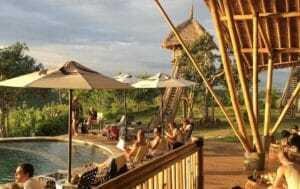 But for a first visit 3 nights seems a good compromise if you plan to stay about two weeks in Bali. Several itineraries will be proposed on this website, for scooter rides, boat trips or even hiking. But you can compose yours! And if you have tips to share or just experiences to tell, you can also do it here!